In 1900, James E. Kuykendall (1874-1960), an African-American native of Butler County, Kentucky, opened a funeral home at 819 State Street in Bowling Green. For more than 50 years, he served the city’s African-American population both alone and in partnership with James A. Boyd. In the 1930s, brothers Francis and Richard Abel established Abel Brothers, which also served the same constituents. 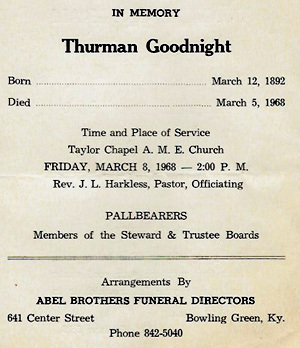 The records of these historic African-American businesses were later placed with Gatewood and Sons Funeral Chapel, and copies are held in the Manuscripts & Folklife Archives of WKU’s Department of Library Special Collections. Dating from 1900-1970, they provide data about funeral dates and expenses, but some are useful genealogical resources because they provide additional information about the deceased such as occupation, cause of death, parents’ names, and place of interment. Also included with these records is a listing of interments in Mt. Moriah, Bowling Green’s African-American cemetery. A finding aid for these funeral home records can be accessed here. For more collections on funeral homes and other businesses, search TopSCHOLAR and KenCat.